​​This optional uniform item is offered through the Navy Uniform Depot (gently used) at a very reduced price. 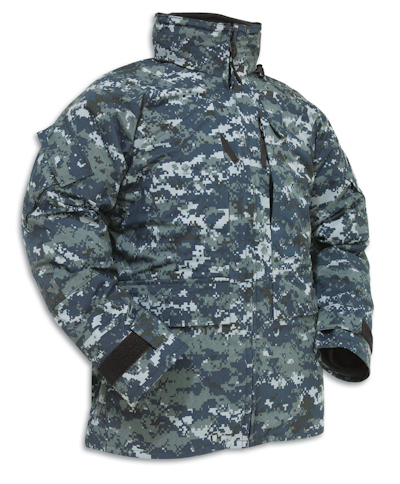 If your cadet plans on participating in winter training this parka will keep them exceptionally warm and toasty, as well as coordinate with your cadet's uniform. The fleece liner comes with a conversion tab kit which must be sewn on to the liner (at your own cost). All liners must be modified with this rank tab, as ordained by both the Navy and the NSCC. You may order both the parka and the liner, or just the liner, which can be worn alone. Be sure to check measurements in the table below before ordering. The parka is $50.00 and the liner is $25.00. The price for a complete set is $75. Bring payment in the form of check (made out to NSCC) or cash to Supply Officer LTJG Karen Vore. The parka is made of waterproof material with barrel sleeves with waterproof underarm ventilating pit zippers. It has a waterproof one-way front zipper concealed by a welt, a permanently attached roll up style stowed hood design. The parka also contains two upper chest pockets with concealed water resistant slide fastener openings, two lower pockets with flaps, concealed hand warmer pockets, adjustable wrist tabs, and a rank/rate insignia tab on the outside. Concealed inside the two lower pockets are adjustable waist draw cord closures with barrel locks and an inside hanger loop. Optional for the parka is a 100% polyester detachable black fleece liner which provides extra comfort and protection during extremely cold conditions. The black fleece liner may be worn as a stand-alone outer-garment in the immediate work area only. Rank insignia must be worn on center chest tab if applicable. Rank insignia is worn on a front Velcro down loop on the front of the parka and black fleece liner.